Country quilt. Country quilts. We hear this term a lot. Why? What is this quilt from the country? In fact, a few days ago our SEO service provider presented us with a laundry list of most often searched terms for Amish quilts. “Country quilts” is right up there at the top of list. While we’re always trying (or forced) to Google-please, we’re not even quite sure that this term brings anything stylish or attractive to mind. 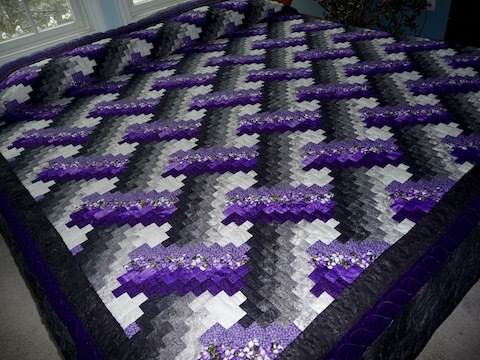 The other day, a really attractive Bargello quilt came in. Many of you know this pattern as a flame-stitched fabric typically found on wing chairs. 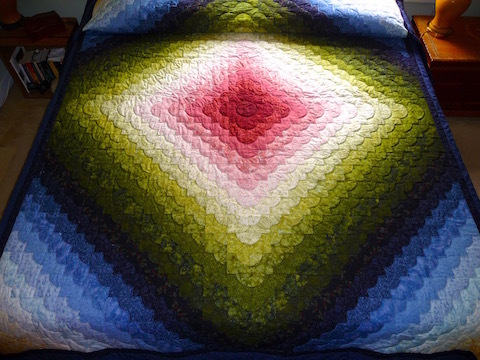 The first time we saw a Bargello pattern incorporated into a quilt we did some research. It certainly is an old and versatile pattern – used in so many ways. But, really, did it come from the American countryside? In truth this pattern goes back to distant European history, possibly as far back as the 1500’s. Most notably, it can be found in various Medici collections as well as the Bargello Museum in Florence. As a side note, another reseller somehow copyrighted this ancient design (no kidding). So in this case, popular and (er) “copyrighted” but a country quilt? We’re not convinced. A few days ago, we got in two additional quilts. A Giant Dahlia and an Ocean Waves. Addressing the Giant Dahlia pattern, again, we just don’t see the term “county quilt” as applicable. So, off we went to again research. This is another pattern attributed to the early European history. It’s said that this is a variation on the Rose Window initially incorporated at the fronts of churches – a practice that began in the 1700’s. Rose windows were very quickly adapted for other uses (woodworking, fabric, weaving). And the Rose window that looks so much like our Giant Dahlia? It’s attributed to oculi typically found in ancient Roman buildings. 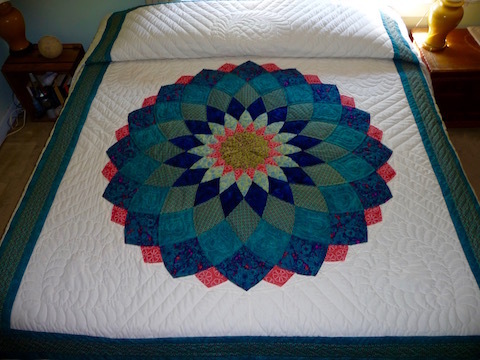 The Oceans W aves quilt currently on our website is a name variation on a Drunkard’s Path. It’s a traditional Drunkard’s Path pattern that the artist renamed. Visually, when she pieced the fabric, the transition resembled waves. This pattern’s history can hardly be considered your granny’s country quilt. Its roots are based in both the Underground Railroad and the Women’s Temperance Movement. Beautiful to look at, with a truly serious and meaningful origin. While it’s all a matter of opinion and in this case, our opinion is an attempt to poke a little fun, we hope you enjoyed this little pseudo history lesson and will take a few minutes to hit our Quilts page and have a look at what’s come in.